Are you looking for a job to work in any of the Government sectors? Here is happy news for you! 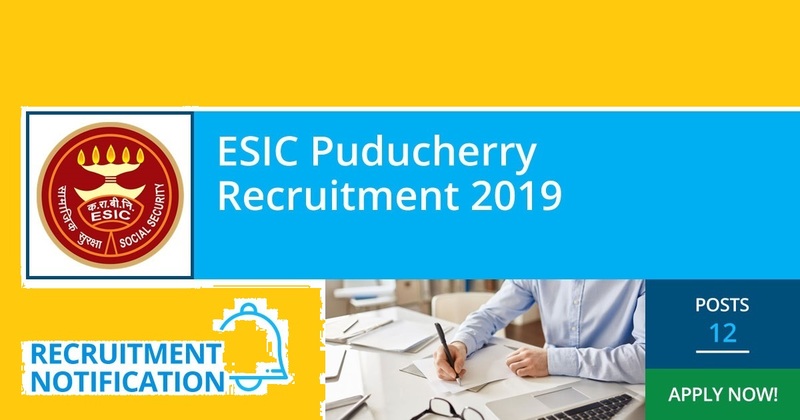 Puducherry government has announced recruitment for a stenographer and Upper Division Clerk (UDC) for filling the vacancy of 12 posts (1 for the stenographer and 11 for the ESIC Puducherry UPPER DIVISION CLERK Recruitment 2019). The last date to apply for the posts is 15th of April 2019. You may visit the official website to have a look at other information related to other information. If you are person holding degree, have certain computer knowledge and possess good working and enable to manage office suit you may eligible and also you should be lying between the age limit of 18 to 27 years. In such cases, you may apply for the job and aim to clear than to be seated in a government job. For further information like the date of the exam, exam center, admit card, results, upcoming vacancies, etc. you may look at the official website, www.esic.nic.in. 3. Working knowledge in computer and using of office suites and database. Online: the candidates may apply for the ESIC Puducherry Jobs 2019 through online mode by using a Credit card, Debit card, Internet banking. Step 6: Make sure you are updated on the official website to have further information like the admit card, exam date, exam center, results, fourth coming vacancies, etc.